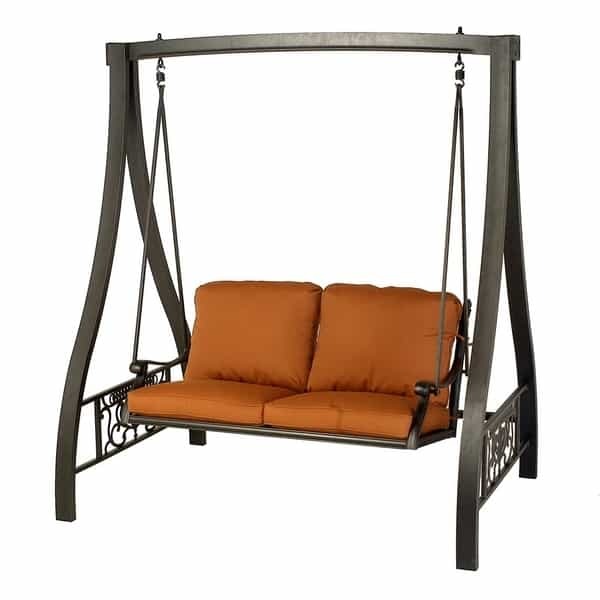 Original & Traditional - A Patio Furniture Swing Showcasing Incredible Style! Are you finding the regular patio swing sets boring and bland? If so, consider the Grand Tuscany A-Frame Swing from Hanamint and Family Leisure. This outdoor patio swing carries incredible style, with antique accents such as scrolls in the ears and armrests, Neo-Roman foliate motifs in the backrest and other authentic design elements that ensure this patio swing set never goes out style. Built from reliable cast aluminum, considered the best patio furniture material in the industry, this piece was made for outdoor use and abuse. Hanamint powder coats and finishes each piece they produce, submitting them to an eight-stage process that will protect against the wears of time, the weather and everyday use. Looking to add an original piece to your outdoor seating selection? This comfortable patio swing features dozens of fabric choices, so that custom look can be easily achieved.